Tuesday was a busy and fun day. 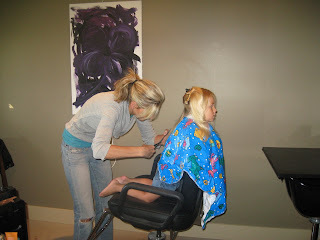 We went over to Ann's house early for some haircuts...Jenna made sure to tell her she wanted "just a little bit from the ends"! 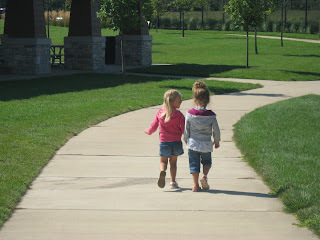 Then we packed up the girls and headed to Millennium Park. The day started out as little chilly so we headed to the playground first. After playing for awhile the temperature was warming up so we headed to the picnic area and had some lunch. 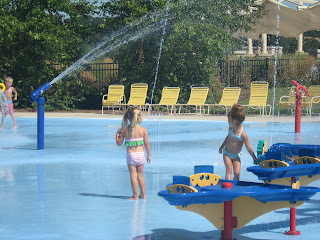 After that the girls decided the first thing they wanted to do was head to the splash pad and then later we spent some time at the beach. Layna and Jenna had so much fun together and Taryn was so good playing in the sand and in the water, just watching the big kids. Hopefully having a little more flexibility in my work schedule will me lots more play dates with Ann and the girls.